God has something in store for YOU! The devil doesn’t know the plans of God. He isnt all knowing. You will never know how much this quote means to me. I am struggling with what I believe is a spiritual attack from the enemy who does not what me to get free. I was looking for a Christian site to get prayer about it, and when I clicked on WCF, this is the first thing I saw. I feel like God is telling me, this is where I need to be right now. Thank you so much for this post. That is true, even young boys throws stones on a fruitful mango tree which has ripe fruits already. You are so powerful till you intimidates the kingdom of Satan .Thats why the devil targets you. Jane .I am going through a similar experience in my life….the past 3 years have been a real struggle for me….thanks for sharing and stay in touch…. Whst a truthful statement thst we need to be reminded about. 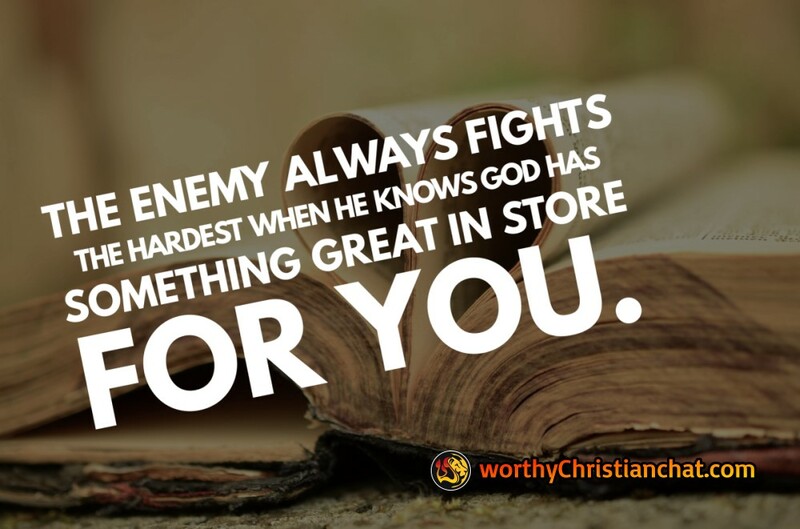 When in the midst of a trial, enemy blocks out the statements that will carry us thru. So we need to help others to remember in a loving supportive way. Thanks for the reminder. You should never let satan take over! Remember to praise our lord! Heard from a teacher that God will not allow you to go through painful situations without Him having a purpose for the pain. So you can focus on the pain or you can wait on Him knowing He will use it for a purpose in your life. Thanks for this great Message. This is so true.but we need to always remember that our heavenly father is always there for us to fight against the enemy.And also He got all power to destroy enemies. He got also all Glory. Have faith and he will direct our part. This almost brought tears to my eyes. I’m going through the most right now and I know it’s not for nothing! I have found that over the years I have brought many heartaches into my life by not being conscious of something about God and His attributes. In fact when you are struggling with something stop and say “what that I know of God am I forgetting?”. The most powerful thing I have found to square things back up and keep moving forward. I believe this is the main problem we are seeing around us when it comes to movements and “isms”. The group embraces a god with a single attribute and get warped and ultimately destroyed. If any young believers here aren’t familiar with this thrilling teaching just Google “Attributes of God”..this needs to be our foundation. I pray the wrong prayers out of desperation. I need to pray for the enemies who despitefully use me. My 29 year old son with asd/add/schizophrenia and I’m sure odd, causes me much anxiety. Feeling pain is better than being numb. Being numb is not pain free, it is just not acknowledging the pain. Acknowledging pain leads to actualization. 1999-2019 Worthy Christian Chat - A division of Worthy Ministries.